Rhyton is the latest project helmed by Dave Shuford – best known for his work with No Neck Blues Band and D. Charles Speer and the Helix – and compatriots Jimy SeiTang (Psychic Ills) and Spencer Herbst (Messages, Matta Llama). I have been an admirer of Shuford’s for awhile now; he is a musician’s musician, who pursues his vision relentlessly without regard to genre, style, texture or time. While Shuford has played everything from country-blues to Greek folk music during his career, Rhyton expresses he, SeiTang and Herbst’s experimental impulses. The band’s first self-titled LP is a masterwork of improvisation – the result of a three-day recording session, the record captures the raw, live feel of these players at their best. I invited Rhyton to be the second band at the NYCTaper 2012 Northside Festival Showcase in hopes of seeing the exact kind of set they delivered – a two-segment, free flowing live jam so new that these songs did not have formal titles. 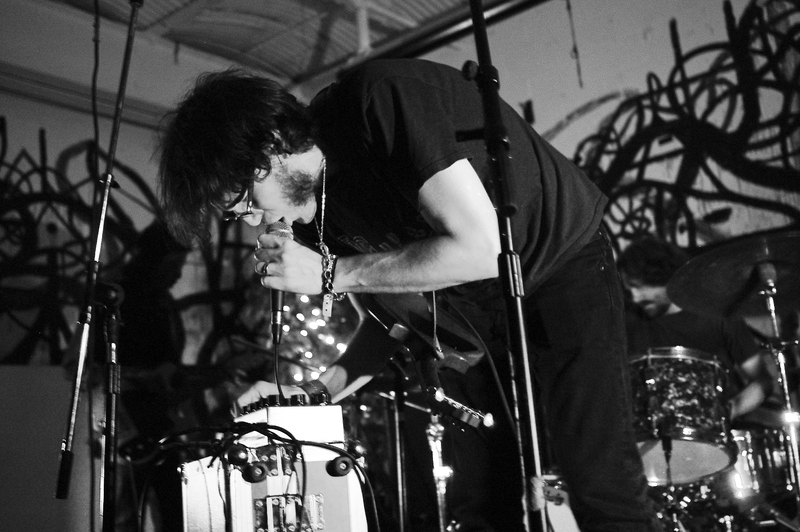 This is music that rewards set and setting, and the post-industrial 285 Kent space, with its psychedelic wall art, was the perfect venue for the band’s mind-bending style of playing. While we (and the band) would have loved for it to be longer, Rhyton’s set hinted at the new thrills to come on their forthcoming Three Lobed Recordings LP The Emerald Tablet, due out later this year. I recorded this set with Audio Technica 3031 microphones split wide at the stage lip, combined with a soundboard feed, to create an upfront, “in your face” style of recording that provides maximum separation between instruments. The entire set is streaming in full below. Enjoy! Special thanks to Dave Shuford and Rhyton for playing the show. If you enjoyed this recording, please support Rhyton, visit their page on Thrill Jockey Records, and purchase their self-titled LP directly from Thrill Jockey [HERE] and look for their forthcoming album on Three Lobed Recordings.